Dengue viral infection with unusual presentations has been described in literature, but autopsy is rarely done and is only limited to some cases, based on the literature review. Here, we present the autopsy findings in three cases of dengue encephalitis. All the three patients clinically presented with signs of meningoencephalitis and were positive for dengue non-structural (NS) 1 antigen (Ag) in the serum and cerebrospinal fluid. 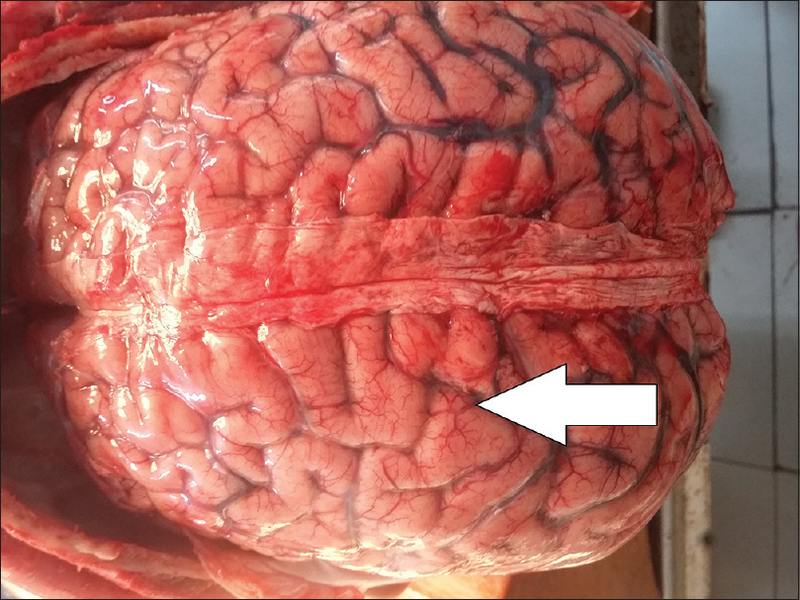 The postmortem findings revealed cerebral edema, inflammation, hemorrhage, and microinfarcts in all the three cases with herniation of the brain in one case. Sub-massive hepatocellular necrosis was seen in one case. The renal findings included hemorrhage into the Bowman's capsule with red cell cast in two of three cases. The pulmonary findings included a diffuse destruction of the alveoli and hemorrhage into the alveolar spaces in all the three cases. Key Message: Dengue viral infection is a multisystem disease that may be frequently fatal. The detailed autopsy findings reported may help in characterizing the pathology of the disease and in preventing dengue related deaths in the future. Dengue is a mosquito-borne viral infection which causes acute febrile illness and occasionally develops into a potentially lethal complication called severe dengue., Dengue is especially found in tropical and subtropical countries. There are four distinct but closely related serotypes of dengue virus–DEN1, DEN2, DEN3, and DEN4. Recovery from infection provides lifelong immunity from that particular serotype. However, cross-immunity to other serotypes is partial and temporary. Subsequent infection from other serotypes may lead to severe dengue infection. The pathogenesis of dengue hemorrhagic fever (DHF) is not fully understood. The disease is thought to be caused by two immune mechanisms, the production of non-neutralizing antibodies that cross-react between different serotypes of the virus; and, the activation of memory T cells sensitized in a previous infection. The target cells are predominantly cells of the reticulo-endothelial system including the spleen, liver, bone marrow, monocytes, lymphocytes, Kupffer cells, and alveolar macrophages. The clinical picture of dengue exhibits a wide spectrum of clinical manifestations ranging from a mild nonspecific or a subclinical febrile illness to DHF and dengue shock syndrome (DSS). Atypical manifestations such as hepatitis, encephalitis, myocarditis, Reye's syndrome, haemolytic uremic syndrome, and thrombocytopenic purpura are also reported with dengue fever. DHF and DSS are the most severe manifestations of the infection and are associated with a poor outcome and a mortality of approximately 5%. Dengue encephalitis is one of the most unusual manifestations of dengue infection, and literature related to the morphology of the brain in cases of dengue encephalitis is very scant. In the present study, we discuss the autopsy findings in three cases of dengue encephalitis where the autopsy was performed in our institution. A 40-year old male patient presented with a history of fever, vomiting, unstable gait, and giddiness of 1-day duration. On examination, his pupils were sluggishly reactive with decreased movements. He also had extensor plantar reflexes, progressive drowsiness, and hypoventilation, for which he was put on ventilatory support. He developed seizures, and magnetic resonance imaging (MRI) of the brain showed features of viral meningoencephalitis. He died within 24 hours of admission. Antemortem investigations showed elevated counts (total leucocytic count: 19300/cmm) with thrombocytopenia (120000/cmm). The NS1 antigen test for dengue was positive in both the serum and in the cerebrospinal fluid (CSF). CSF cytology showed features suggestive of viral encephalitis (CSF study: total cells 240/cmm, red blood cells (RBC): 240/cmm, white blood cells (WBC): Nil, protein: 1012 mg/dl, globulin: increased, sugar: 116 mg/dl). A 19-year old male patient presented with a history of sudden and progressive deterioration of consciousness, vomiting, and unsteadiness of gait after an unaccustomed exertion. On examination, he was unresponsive and pupils were sluggishly reactive. The patient also had decerebrate posturing. Non-contrast computed tomography (NCCT) and contrast-enhanced computed tomography (CECT) of the brain revealed bilateral thalamic involvement with hemorrhagic transformation and tonsillar herniation. The patient was intubated, and emergency decompressive surgery was done. The patient died due to an intraoperative cardiac arrest. Antemortem investigations revealed thrombocytopenia (platelets: 100,000/cmm), deranged liver function tests [serum glutamic oxaloacetic transaminase, SGOT: 2024 U/L, serum glutamic pyruvic transaminase, SGPT: 1188 U/L, serum alkaline phosphatase, (SAP) 167 U/L]), a deranged coagulation profile [international normalised ratio INR]: 3.68, partial thromboplastin time with kaolin, also known as activated partial thromboplastin time (PTTK) 96 s, and altered renal function tests (creatinine 3.8 mg/dl). His serum and CSF showed positivity for dengue NS1 Ag. A 27-year old male patient presented with a history of high-grade fever with chills, anorexia, nausea, and vomiting of 5-day duration. On examination, he had altered sensorium, disorientation, generalized erythema, and subconjuctival hemorrhage. Ascites, pleural, and pericardial effusion was found on imaging studies. Investigations revealed NS1 Ag positivity in both the serum and in the CSF. The patient also had thrombocytopenia (platelets: 20,000/cmm) and deranged liver function tests (serum bilirubin: 11.4 mg/dl, SGOT: 14990U/L, SGPT: 3723 U/L, SAP: 209 U/L, lactate dehydrogenase (LDH): 11184 U/L). He developed hematemesis, mucosal bleeding, anuria, and died of refractory hypotension (CSF study: total cells 20/cmm, RBC: 20/cmm, WBC: nil, protein: 200 mg/dl, globulin: increased, and sugar: 98 mg/dl). On external examination, all the three cases showed presence of ecchymotic and/or purpuric spots over the body as well as presence of ecchymotic and/or purpuric spots over the viscera. The ecchymotic spots were most often over the omentum and intestines. The kidneys showed perirenal hemorrhage, and the liver and spleen were enlarged with congestion of the external and cut surfaces. 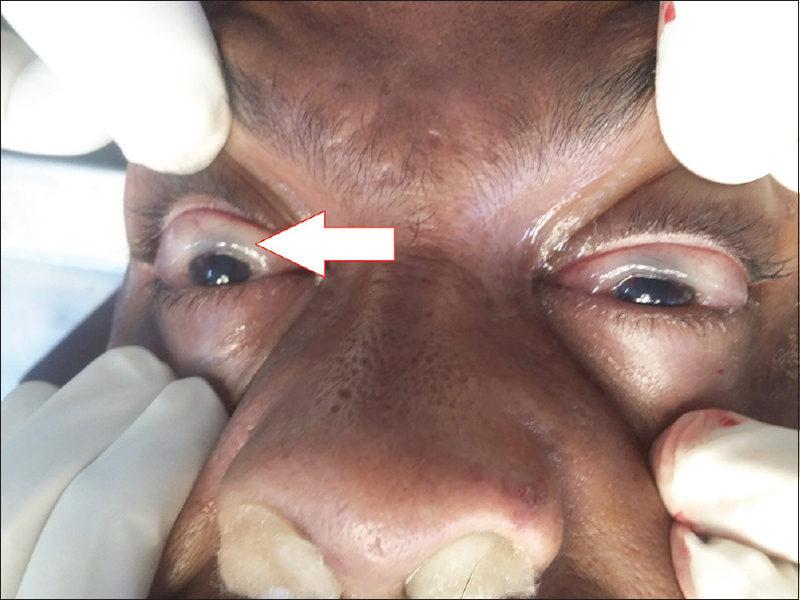 In the first case, there was periorbital edema and palpebral conjunctival prolapse was seen with extensive bleeding into the lumen of the gastrointestinal tract [Figure 1]. In the third case, generalized edema was noted, and the lungs were heavy and boggy (weight: 1.5 kg each). No other significant gross morphological changes were seen. The calvarium was opened in all the cases and the brain was exposed. The dura appeared congested and tense in two cases (Cases 2 and 3). On opening the dura, the brain in the above two cases appeared edematous with obliteration of the sulci and flattening of the gyri [Figure 2]. 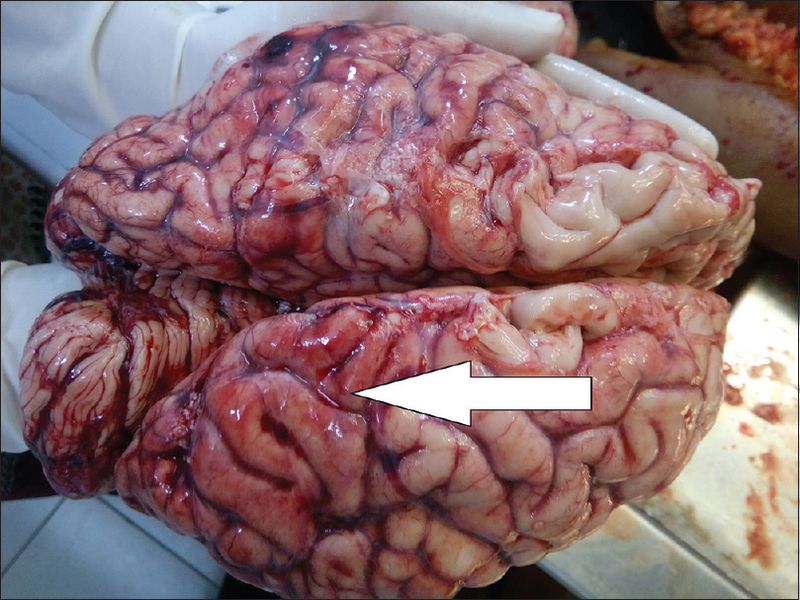 In the first case, serial cut sections of the brain showed only peticheal hemorrhages throughout the gray and white matter [Figure 3]. In the second case, where a decompressive surgery had been performed, the brain showed a large clot in the infracerebellar area with hemorrhagic transformation of the thalamus, midbrain, cerebellum, pons, and indentation of the tentorium cerebelli due to compression of the edematous brain (at site of the operation). In the third case, there was subarachnoid hemorrhage over the left frontal and right parietal lobes with punctuate hemorrhages in the deep white matter of the brain. Sections from the lungs in all the three cases showed diffuse alveolar damage with hemorrhage, hemosiderin-laden macrophages, and type 2 pneumocytic proliferation. Sections from the liver showed a congested capsule in Case 1 and sub-massive hepatocellular necrosis in Case 3. 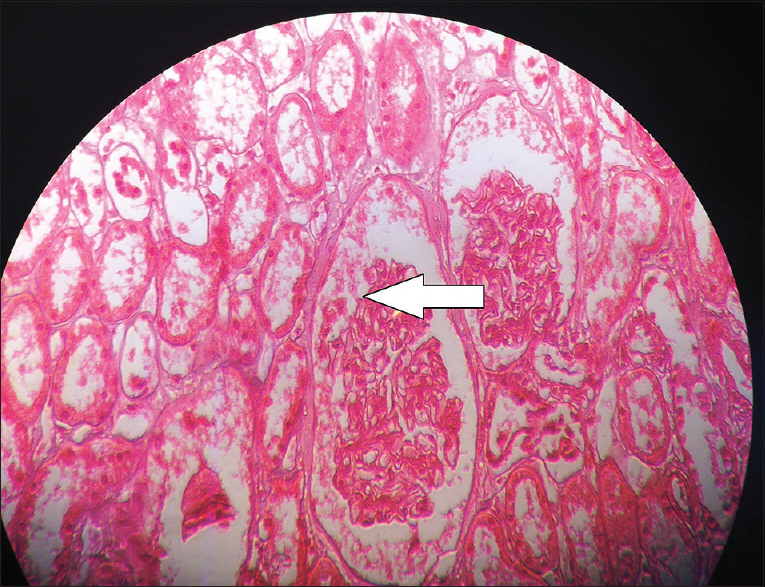 Sections from kidneys in all the three cases showed proximal tubular necrosis with hemorrhage into the Bowman's space and red cell casts in Cases 1 and 2 [Figure 4]. Sections from the brain in Case 1 showed areas of inflammation and edema [Figure 5]. In Case 2, sections from the hemorrhagic area showed hemorrhage with surrounding parenchymal edema in the thalamus, midbrain, and cerebral cortex. These areas also showed a mononuclear inflammatory infiltration with scattered foci of a neutrophilic infiltrate. In the third case, there were hemorrhagic areas in the frontal and temporal cortex along with a mononuclear inflammatory infiltrate and congested dilated capillaries. There was also parenchymal edema and microinfarcts throughout the midbrain, pons, medulla, cerebellum, cerebral cortex, and dura. There were also parenchymal edema and mononuclear cell infiltration throughout the brain parenchyma. The inflammation in the different areas of the brain was graded on a semiquantitative scale as mild (grade 1), moderate (grade 2), and marked (grade 3). The different areas which were evaluated included the frontal, parietal, temporal and occipital lobes, the cerebellum, pons, midbrain, and the medulla. [Table 1] shows relative inflammation and edema in the different areas of the brain. An attempt was also made to correlate the grades on inflammation and edema in different areas of the brain to assess if there was any correlation between these two variables in different areas of the brain. The data were analyzed using a statistical software SPSS (IBM; Statistical Package for the Social Sciences [SPSS] Software for Windows, version 16). The test used was the chi square test for assessing the trend. A P value of 0.05 was considered significant. The initial assessment only included the grade of edema in different areas of the brain. As shown in [Table 2], there was no significant association between the grade of edema in areas of the brain at a P value of 0.05. However, if the P value is taken as 0.1, it was seen that there was a significant association detectable with the degree of edema in the medulla, pons, and midbrain. The frontal and parietal lobes also showed some degree of association; however, there was no significant correlation with the other areas of the brain. An attempt to grade the degree of inflammation in different areas of the brain was also made. However, a statistical analysis could not be performed. Therefore, an analysis of the degree of inflammation as well as the edema in the different areas of the brain was made. The results are shown in [Table 2] and [Table 3]. As can be seen from the table, there was a significant association between the inflammation and edema in the medulla, pons, and midbrain. There was also a significant association between the frontal and temporal lobes as well as the occipital and parietal lobes. There was no association between the forebrain and the hindbrain structures except that the midbrain showed some association with the parietal lobe. The cerebellum did not show any significant association of inflammation and edema with any of the other areas of the brain. The manifestations of dengue fever can be protean and includes neuromuscular complications, encephalopathy, Guillain–Barre syndrome, hypokalemic paralysis, opsoclonus-myoclonus syndrome, myelitis, and acute disseminated encephalomyelitis., Encephalopathy has been well reported and has classically been thought to result from the multisystem derangement that occurs in severe dengue infection. However, viral neurotropism may occur causing direct viral encephalitis., Dengue encephalitis is not an uncommon feature in dengue viral infection. Though the diagnosis of dengue encephalitis is made clinically, encephalitic features are not often seen microscopically in dengue viral infections. Hence, the term ‘dengue viral encephalopathy’ is used most often to define the neurological manifestations in dengue viral infection. Not many autopsies have been done in fatal dengue encephalitis. We believe that this is the largest autopsy series in cases of fatal dengue encephalitis. The autopsy findings in the brain in this series of cases showed cerebral edema with obliteration of the sulci and flattening of the gyri. The dura was tense and there were hemorrhagic spots all over the brain on gross examination. Hemorrhage is a consistent feature in all cases suffering from dengue fever, a fact that has been noted in other autopsy series., Microscopic examination showed cerebral edema, inflammation, and hemorrhage as the predominant findings. One of the cases showed microinfarcts within the brain matter and massive cerebral edema with herniation of the brain. Only one of the cases showed a mild focal neutrophilic infiltrate. The results of the statistical analysis showed that there was a significant association between the inflammation and edema in the medulla, pons, and midbrain. Similarly, there was a significant association between the inflammation and edema in some of the areas of the forebrain. These findings suggest that inflammation and edema in one of the areas of the hindbrain is immediately followed by inflammation and edema in the other areas of the hindbrain. The hindbrain also showed significant edema, which was out of proportion to the degree of inflammation. The latter entity was relatively less in the hindbrain structures. In sharp contrast, the degree of inflammation in the forebrain was relatively more in comparison to the hindbrain structures. However, the degree of edema was relatively less. These findings suggest that the inflammation in cases of dengue encephalitis is relatively more in the forebrain structures. The edema in the medulla, pons, and midbrain would probably be the terminal event leading to death in these cases. Other gross examination findings included massive bleeding with clots and ecchymotic and purpuric patches over the viscera. Ascites, pericardial and pleural effusion, hemorrhage into the alveolar spaces in the lung, hemorrhage into the Bowman's space, and tubular red cell casts were also seen. 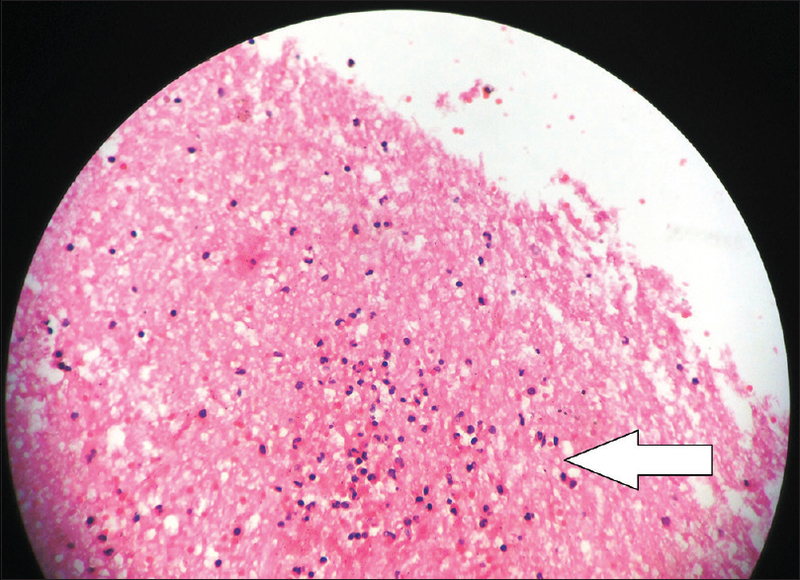 Sub-massive hepatocellular necrosis was seen only in one case, although the liver function tests were abnormal in all the three cases. There were no signs of involvement of the myocardium in any of our three cases. Dengue viral infection is a multisystem disease, which can rapidly turn fatal if not diagnosed and managed from the beginning, as was evident by the death of the two patients in our study, within 24 h of admission to hospital; unaccustomed work/exertion during the period of illness can also lead to a fatal outcome, as evident in our case (Case 2). Research in the field of management of dengue viral infection and prevention of complications is required to prevent such dengue related deaths in the future. WHO; New Geneva: 2009. Dengue: Guidelines for Diagnosis, Treatment, Prevention and Control. Barniol J, Gaczkowski R, Barbato EV. Usefulness and applicability of the revised dengue case classification by disease: Multicentre study in 18 countries. BMC Infect Dis 2011;21:1-6. Jessie K, Fong MY, Devi S, Lam SK, Wong KT. Localisation of dengue virus in naturally infected human tissues, by immunohistochemistry and in situ hybridisation. J Infect Dis 2004;189:1411-8. Gulati S, Maheshwari A. Atypical manifestations of dengue. Trop Med Int Health 2007;12:1087-95. Garg RK, Malhotra HS, Jain A, Malhotra KP. Dengue-associated neuromuscular complications. Neurol India 2015;63:497-516. Verma R, Sharma P, Garg RK, Atam V, Singh M, Mehrotra HS. Neurological complications of dengue fever: Experience from a tertiary center of north India. Ann Indian Acad Neurol 2011;14:272-8. Murthy J. Neurological complications of dengue infection. Neurol India 2010;58:581-4. Varatharaj A. Encephalitis in the clinical spectrum of dengue infection. Neurol India 2010;58:585-91. Rathi KR, Arora MM, Sahai K, Tripathi S, Singh SP, Raman DK, et al. Autopsy findings in fatal dengue haemorrhagic fever - 06 Cases. Med J Armed Forces India 2013;69:254-9. Bhushan B, Sardana V, Maheshwari D, Ojha P, Mohan S, Moon P, et al. Immune-mediated neurological manifestations of dengue virus- a study of clinico-investigational variability, predictors of neuraxial involvement, and outcome with the role of immunomodulation. Neurol India 2018;66:1634-43.